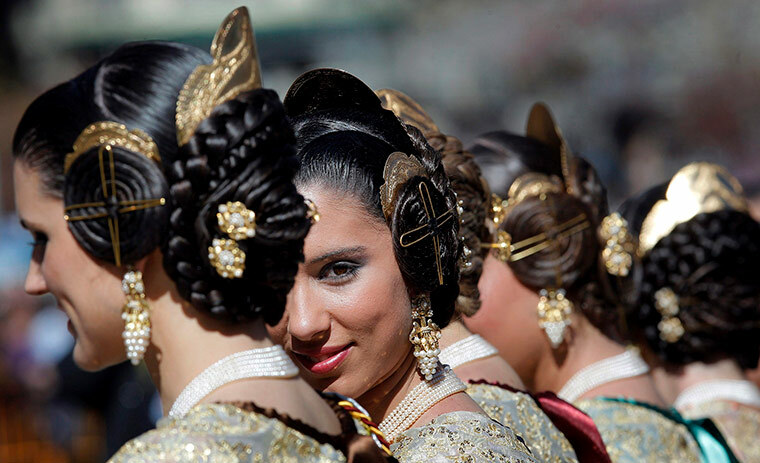 ‘Fallera’ is the traditional hairstyle of ‘Valencia’, one of the largest towns of Spain. 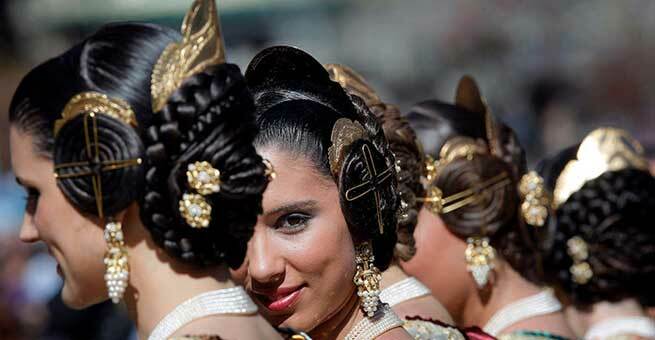 This apparently complicated-looking hairdo is named after the ‘Fallas’ celebration as women in that city wear it during that particular time. ‘Fallera’ basically symbolizes ‘royalty’. 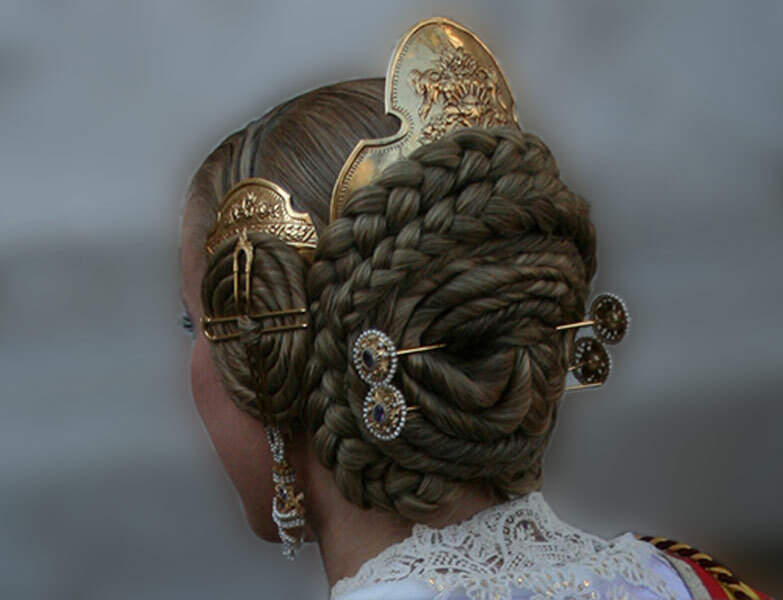 According to custom, high class women wear this hairstyle in order to emphasize their strong personality. But you can also try out this and add a zing to your appearance. 1. At first, brush the hair and make it smooth as well as tangle-free. Start creating a center part by using the tail comb. But as soon as you reach the half way, remove the comb. It means, there will be a half center part up to the middle of your head. Now, place the end of the tail comb by one of your ears and draw a vertical line up to the other carefully. This way, you get another part from ear to ear and all your hair is split into three neat sections. 2. Brush down the hair lying on your back and tie it into a low ponytail by using the hair tie. The hair present in first two sections might get into your way. So, if you wish, you can clip them up and maintain the tide look easily. 3. However, once you are done with doing the ponytail, remove the hair clips. Start rolling the hair of the side sections. But make sure that you do not end up pulling the locks too tight at the temple area. There must be a fluffiness near your forehead. 4. Now, take the end portions of both rolls in your hands and wrap them one over another around the base region of the pony. It will result into a band of hair. Also, grab the end of the pony and entwine it around the band. As a result, you will get a nice flat bun. Make use of bobby pins for keeping the bun at its place. Applying some hairspray will also help in avoiding fly-aways. 5. After that, place the moño over the bun. Use as many bobby pins as required for securing it. Take two large gold pins and slide them in the moño. While doing this, make sure that you also grasp the natural bun along with the moño. Also, slip other two large gold pins inside it simultaneously. 6. Place two rodilletes at both sides of your head in a proper manner. Use bobby pins to keep them tight. You also need to create ‘X’ with two regular gold pins on each side. 7. Finally, take the peinetes and position them over the rodilletes. It will go inside your hair easily. There is no need to use bobby pins for this purpose.